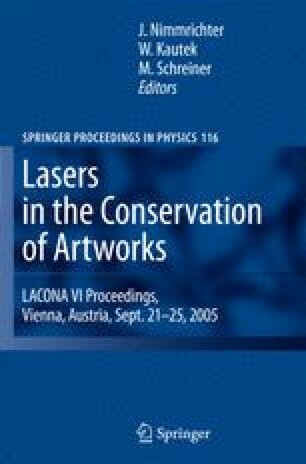 Results of laser cleaning experiments on different gilding types like leaf gilding and fire gilding are presented in this contribution by means of three tested art objects. The reflectivity of gold is advantageously high for the typical laser cleaning wavelength of 1,064 nm. Additionally, to avoid damage like gold loss, the transfer of the absorbed laser pulse energy into the art object by thermal conduction is considered. Fire gilded surfaces are most easily cleaned because of the good heat transfer conditions which imply a high threshold intensity with respect to damage. This is different for leaf gilded surfaces but suitable laser cleaning parameters have also been found for this case. The results of laser cleaning experiments are presented by photography, microscopy, SEM and EDX analysis.